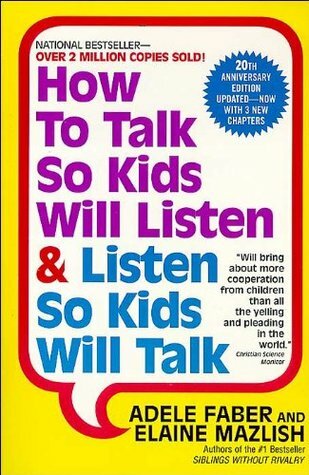 How to Talk So Kids Will Listen & Listen So Kids Will Talk. She tried some of the techniques and found that they did indeed help to diffuse situations in her house. With three fussy, whiny toddlers in my house, I could use a new method of communicating, so I requested the book from the library! I also saw that the same authors (Faber and Mazlish) had a book called Siblings Without Rivary, so I requested that as well. I had recently read (and loved) Grace Based Parenting, so I was hoping that these books would fit in with his philosophy, and they did. Grace Based Parenting gives the big picture for what successful parenting looks like in God's eyes, while Faber and Mazlish's books give you the step by step methods for dealing with countless situations that occur in our daily lives. I love how detail oriented these books were. They give you the exact words to say to your child(ren). The underlying principle of their methods is that children will behave best if we acknowledge, rather than dismiss their feelings and treat them with respect. While that seems like a simple idea, it can be difficult to put in to practice, which is why I loved the detail in the books of showing how conversations might progress. 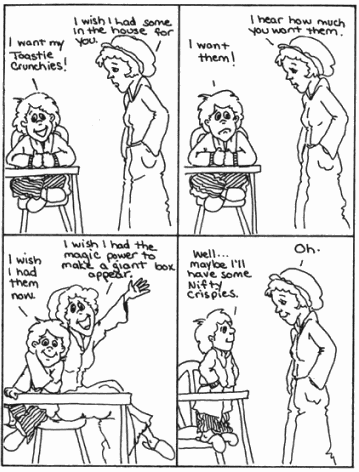 They use written dialogues and cartoons to illustrate the concepts. I'm still learning to put all the methods into practice, but the picture above is from the book and shows one of the skills that I mastered very quickly because it was so helpful with my kids - "Give a child his wishes in fantasy". I just love how simple and practical these books are, and how they are working for my kids! I recommend highly! I never buy books, but will be buying my own copies of each of these. Amazon has a lengthy preview of the book (by clicking the "look inside") which will give you a much better feel for the books than I can explain here. I will have to check these out, they look like great resources! These are great books. The best parenting books seem to be the ones that train us, what to say and how to react, the kids adjust their behavior to ours. I could use a refresher course in talking to my kids. Some days, Ai yi yi.